WooCommerce Recover Abandoned Cart allows you to recover WooCommerce Abandoned Carts and earn more revenue from your WooCommerce Shop. Over 75 Reasons to know more about WooCommerce Recover Abandoned Cart. 1. Recover Lost Sales through WooCommerce Recover Abandoned Cart. 2. Works for Members and Guests. 3. Works with Simple Products and Variable Products. 4. For Members, a cart is captured as soon as the product is added to the cart. 5. For Guests, the cart is captured after the user enter their email id on the checkout page. 6. A separate table for displaying the captured carts. 7. Time to consider a cart as abandoned can be configured for Members and Guests. 8. Cart list capturing can be restricted to specific user roles, usernames and user ids. 10. Captured carts can be filtered based on subscribed users/unsubscribed users. 12. Captured carts can be deleted and restored. 13. Cart list table can be exported as a CSV file. 14. Filter hooks for CSV export. 15. Cart list capturing behaviour can be customized. cart will be considered as Abandoned. 17. Site admin has the option to consider the previously failed orders as Abandoned. 18. When a new cart is about to be captured for a user site admin has the option to remove the previously abandoned carts of that user. 20. Multiple email templates can be configured. 21. Email templates can be Enabled/Disabled. 22. Email templates can be duplicated. 24. Abandoned cart emails can be sent through WooCommerce Template/HTML Template. 25. Site admin has the option to Enable/Disable all email templates at once. 26. Recovered order count is displayed for all email templates. 27. Highly customizable email templates. 28. Automated cart recovery emails can be sent to the users who have abandoned their purchase. 29. The duration to send the cart recovery emails can be configured by the site admin. 30. Multiple automated cart recovery emails can be sent to a user for abandoning one cart. 31. Site admin can send manual emails to any abandoned cart. 32. For automated emails, email sending time can be calculated based on the Cart Abandoned Time/Previous Mail Send Time. 34. Site admin has the option of restricting abandoned cart emails to specific email providers. captured cart contains a product which was already purchased by that user. 36. Product info table in the abandoned cart emails can be customized. 37. Product purchase links can be sent in the abandoned cart emails. 38. Cart link click count from the abandoned cart emails is captured. 39. Site admin has the option to Include/Exclude shipping cost in abandoned cart emails. 40. Site Admin has the option to Include/Exclude tax cost in abandoned cart emails. 41. Users can unsubscribe from receiving abandoned cart emails. 43. Test Emails can be sent. 45. Autogenerated coupon codes can be sent in abandoned cart emails. 46. The following discount methods can be configured. 47. The validity of the coupon can be set. 48. The minimum amount and maximum amount for coupon usage can be set. 50. Autogenerated coupon codes can be restricted from being used for Sale Priced Products. 51. Site Admin has the option to enable Free Shipping option for autogenerated coupon codes. 53. Site Admin has the option to enable the auto-deletion of coupons once it has been used. 54. Site Admin has the option to enable the auto-deletion of coupons once it has been expired. recovered once the purchase is completed. 57. Email notification to the site admin when an order is recovered. 58. Any abandoned cart list entry can be manually marked as recovered. 59. The recovered orders will be listed in a separate table. 60. Site admin has the option to automatically delete the other New Carts/Abandoned Carts of a user when one of their abandoned carts is recovered. 61. Site admin has the option to automatically delete cart list entries with Recovered status from the cart list table after x days. 62. WP Cron and Server Cron supported. 63. WPML string translation and WooCommerce Multi-Lingual. 65. PO files provided for translation. 66. Extensive list of shortcodes. 69. Reward Points that can be earned is displayed in the cart list table and abandoned cart emails. 70. The coupon that can be earned is displayed in the cart list table and abandoned cart emails. 71. User selected donation amount will be captured and displayed in the cart list table and abandoned cart emails. 72. When a user tries to complete the purchase using the link provided in the abandoned cart email, the previously selected donation amount will again be added to the cart. 73. When a user abandons a Membership purchase, the Membership Plan access product will be captured in the cart list table and Email will be sent. 74. When a user abandons a Subscription Purchase, the Subscription Product will be displayed in the cart list table and Abandoned Cart Emails. 75. User selected amount will be captured and displayed in the cart list table and Abandoned Cart Emails. 76. When a user tries to Complete the purchase using the link provided in the Abandoned Cart email, the user can purchase the product for the same price which they entered earlier. 77. When a Cart is Abandoned, the User Selected Currency will be captured and displayed in the cart list table and Abandoned Cart Emails. 78. When a Cart is Abandoned, the User Selected Currency will be captured and displayed in the cart list table and Abandoned Cart Emails. 79. When a Cart is Abandoned, the User Selected Currency will be captured and displayed in the cart list table and Abandoned Cart Emails. For more information check out WooCommerce Recover Abandoned Cart on WP Mayor. 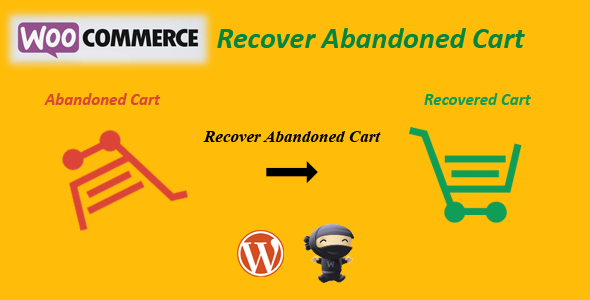 You can purchase WooCommerce Recover Abandoned Cart at codecanyon.